Last night there we were sitting quietly inside the cabin all on our own moored out in the countryside when everything turned to daylight from the headlamp of a boat cruising by night. Both of us went outside to watch it go past in the dark. Actually the headlight didn’t appear to illuminate much and I don’t think we would be too keen to emulate the practice. 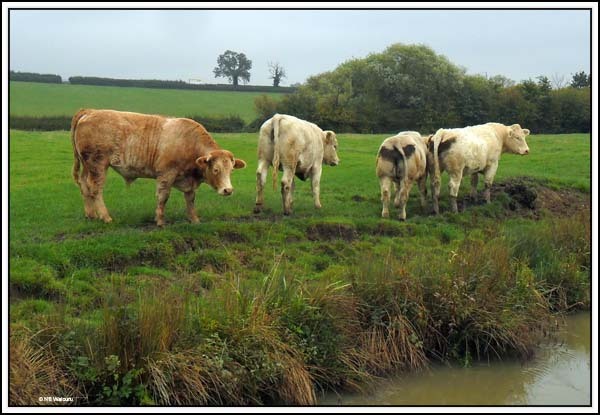 Next morning, whilst I was examining the inside of my eyelids, Jan watched a boat and butty (car & trailer) pass us heading towards Braunston. 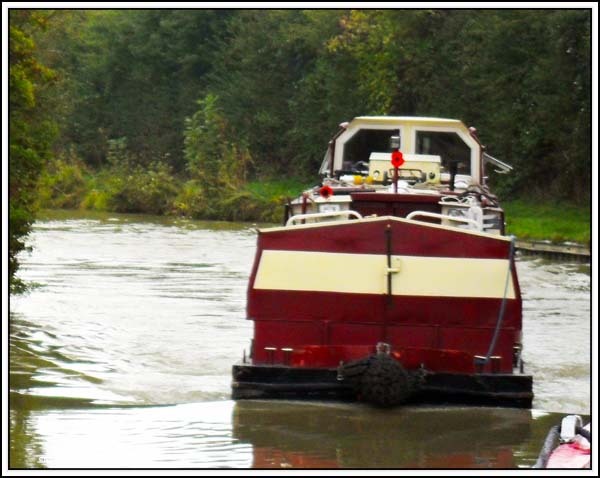 Once the sloth had been dragged from under the duvet we managed to get underway heading south towards Braunston. Where the canal get a little ‘curly wurly’ I happened to noticed a boat and butty coming our way on a distant bend. We managed to get well over to the right as they appeared to need the depth more than us. I asked Jan if it was the same boat & butty that passed when I was in bed. Apparently not! We’d only gone another couple of kilometres before seeing what appeared to be a wide-beam boat coming around the bend on a bridge-hole. This is a narrow canal which was all the more surprising. 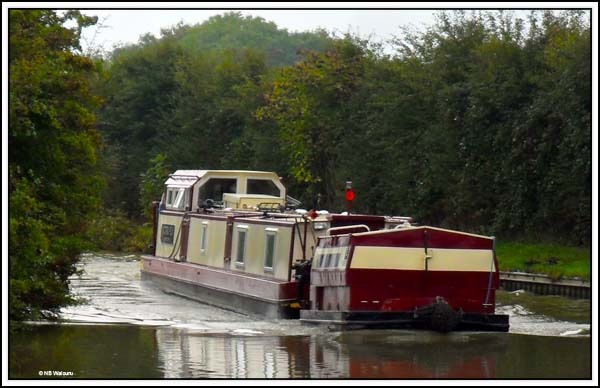 When the bow eventually appeared the boat seemed wider than a conventional narrowboat, but not as wide as a wide-beam. It actually had a small unpowered butty connected to the front of the boat. 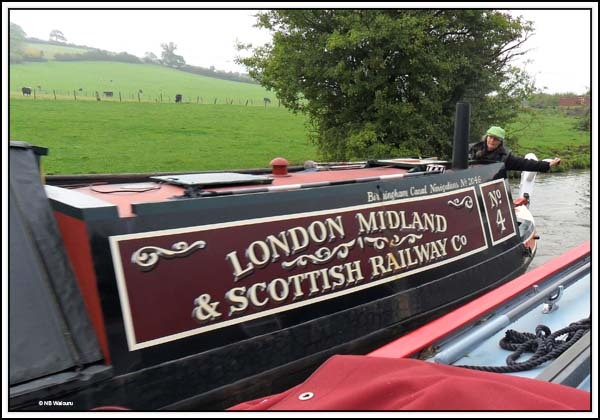 Eventually I realised it was probably the same width as a conventional narrowboat but the vertical sides and very narrow gunwales gave the illusion of greater width. The vessel appeared to be displacing a sizeable volume of water but all Jan could say was “I bet the steerer doesn’t get wet inside that cabin!” See how we think of different things when looking at the same scene. The locals weren’t all that interested in us. Jan call out to them but after a quick glance they turned away without uttering anything. We did another load of washing whilst on the move. This time it was the bed linen. The new winter flannel sheets have covered the carpet with lint and, hopefully, the wash will remove the remainder from the sheets. It’s too cold and damp to dry the sheets outside so they had to also go through the drying cycle on the machine. All of this needs the engine running but if we wait until it has been running 30 minutes before starting the washer/dryer the bulk charge is finished and we have spare generating capacity. The boat with bitty is moored in front of Yarwood tonight. The bitty contains the owner's mobility scooter. It must be a huge mobility scooter! Maybe he steers it from the towpath whilst riding his mobility scooter? Hi there Tom and Jan. Good to hear you're both well. We're taking a very leisurely cruise on the Llangollen at the moment and have had 3 occasions that have brought you both to mind. The first was a sighting of your cruising buddies boat Kelly Louise. Then we were passed by Ben Harp boat Too Hoots. Then your comment of new fleecey sheets ! SNAP - great aren't they!! Don't want to get up in the morning!! Good news about the Passport too. 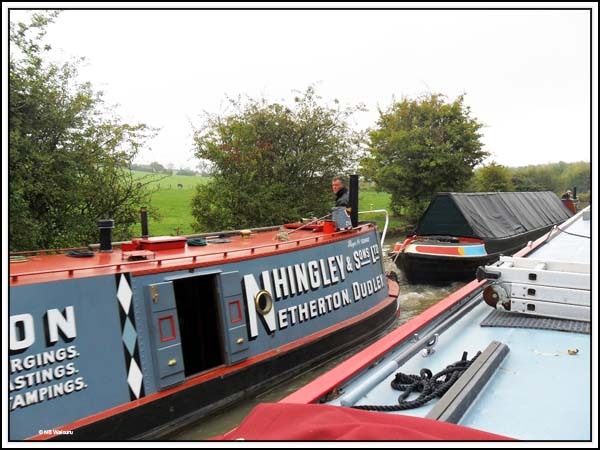 We met the guy on Victoria Plum at the locks above Cropredy last week. He walks using a walking stick & remote controls the boat using controls that he wears around his neck. He helped me with the gate (he insisted even though I am quite capable) and moved his boat remotely out of the lock past ours waiting to go in, then moved it back next to the towpath. It's great to read that he has found a way to enjoy the canals despite his handicap!